How to Make Chocolate Bark the Fast Way. Chocolate bark is one of the easiest to make and most enjoyable desserts you can offer friends and family. It is a wonderful gift anytime year round. In Europe you can find chocolate stores that specialize in selling only chocolate bark (mostly in Southern France). 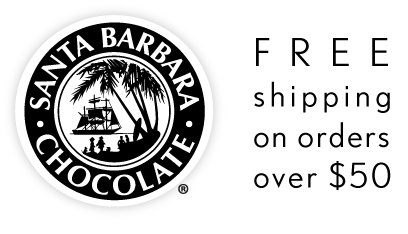 Here in Santa Barbara when we first started our original chocolate shop back in 1992 we specialized in gourmet bark and tiles. The chocolate tile below was our best selling bark (very thin dark chocolate spiced with cinnamon and fresh ground red chili and decorated with a cocoa butter transfer sheet). The simplicity and ease of making chocolate bark is what makes it so special. When you make it thin it can offer a gourmet tasting experience much more than a thick chocolate bar piece or chunk. The thin nature of what we made was what allowed us to gain so many chocolate lovers - it is more than bark when thin, it is gourmet (As a chocolatier I have studied the shape and thickness of chocolate on flavor perception and thin is almost alway better when making gourmet chocolates). 1) Determine first if you want your inclusions completely covered in chocolate and embedded or if you want the inclusions visible in the bark on top. On top the chocolate is best for chunky pieces that have a visual impact. Embedded in the chocolate is better for spices, small pieces or inclusions that might go stale more quickly (the chocolate covering keeps the inclusions fresh longer as it prevents air exposure). 2) Melt your chocolate ingredient choice on a low heat, stirring constantly so it is completely fluid to no more than 89F or melt at a higher temperature but then ensure you will temper chocolate. 3) Add your ingredients if you plan to coat the inclusions completely (chopped almonds for example). We usually use about 50% of the chocolate weight as inclusions (this will vary based on the size and shape of the inclusion). I personally like a more present chocolate flavor as compared to inclusion and this is why we use 2 parts chocolate to 1 part inclusion. Many recipes call for a ratio of 1:1. This stage is also a good time to add in flavorings or spices (if you use a flavoring use only oil base like orange oil). 4) Pour the liquid melted chocolate into a parchment lined pan (this is the bark chocolate mould). 5) Once poured into the chocolate bark pan, sprinkle the chunky inclusions on top (if you are using chunky inclusions). Freeze dried fruit powders are beautiful and look great on thin bark pieces. 6) Bounce the pan very lightly for a short time so as to set the inclusions and pop any air bubbles. Do this regardless if you have chunky inclusions or fully coated small inclusions. 7) Place the pan level in the refrigerator for 5-10 minutes or longer if needed to set the chocolate bark. 8) Pull the pan out of the refrigerator once the bark is made solid. 10) Cut the bark into squares like tiles or break irregular for traditional bark. Thin Dark Chocolate Bark with freeze dried fruit powder on top. Raspberry pieces taste great with dark chocolate. freeze dried powders taste best on the bark rather than inside as they have a striking color and look. Also, the fruit flavor is more present and bigger when on top instead of being inside the chocolate bark. 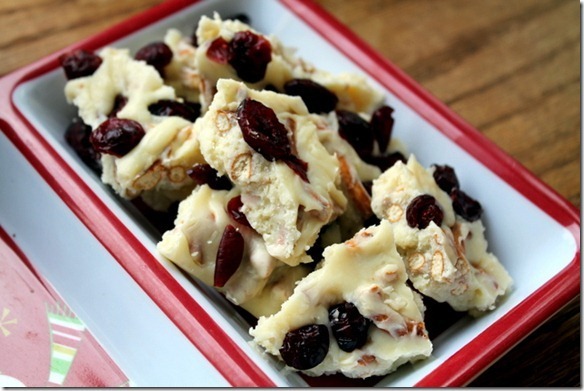 Chocolate Nut Bark broken into irregular shapes is best for chunky inclusions like large nut pieces. Famous Chocolate Tiles by Santa Barbara Chocolate. This bark is made with chopped almonds and sea salt all mixed into the liquid chocolate before pouring. This particular type is milk chocolate. Right after removal from the refrigerator cut the bark with a heavy knife or cleaver to make the square tile shape. This is one of our favorite recipes because of the flavor combination and festive look. 16 oz Belgian White Chocolate from Santa Barbara Chocolate (melt at a low temperature with indirect heat using a double boiler is perfect). Add the cranberries and pistachios to the melted white chocolate and stir. Pour into a lined sheet pan. Allow the bark to set up and then break into pieces and enjoy.